What “Energy Medicine” does and what I think about that. Ten minutes of self-treatment can do more than years of drugs or therapy. Please notice I said “can” and not “will”. There are no guarantees here, but so far, I’m impressed. Today’s post is a continuation of one I began yesterday about the Energy Psychology conference I attended recently. That one started to get very long, and I had other topics to address. Energy Psychology uses points on the body known as “Meridians” determined thousands of years ago by practitioners of Traditional Chinese Medicine, and also called “Acupuncture Points”. We don’t use needles, or any invasive procedures, but rather teach people to address their own energy system. Some practitioners use traditional (eastern) Indian practices (Yoga and Ayurveda) as well, which also have energy centers (chakras) as part of their system. For myself, any time I have a pattern of behavior that isn’t serving me, or any time I’m not feeling well for any reason, I can use these techniques to feel better, or engage behaviors which better serve me. I have transformed relationships with some of my family members, both living and deceased. The work with people who have passed on is particularly moving. It’s our memories and encoded emotions about the people which continue to cause hurt, even after the person has gone, and these practices can allow the stuck energy around them to go. We still retain the memories, they just don’t hurt. As for physical issues, practitioners make no claims to cure everything, or anything, but the phrase “try it on everything” applies. Many, many people (myself among them) have gotten tremendous physical relief for a variety of conditions after releasing the “stuck energy” from their bodies. A question I’m sometimes asked, (and I’ll warn you in advance that I don’t have a good answer for this,) is “If these methods have been around in China and India for thousands of years, why aren’t all the people in those countries walking around in perfect health and bliss?” This is an excellent question. I can only surmise that all peoples and countries go through eras and trends. These ancient methods are not currently very “trendy” even in their home countries at the moment, and historically there have always been people that seek power which undermines the helpfulness of subtle energy medicine. This is not a good answer, and I’m planning more research into the social history involved. Having said all that, I am aware of many people who are using these techniques now, and getting real results. There are lots of offshoots of the original discovery in this field, Thought Field Therapy (TFT) developed by Dr. Roger Callahan. The story of its discovery and development is fascinating, and can be read here if you’re interested. My favorite technique remains the same, even after learning wonderful new ones at the conference. EFT (Emotional Freedom Techniques) is a simplified protocol derived from TFT, as its developer found that it worked just as well—and took less time—to treat all the major acupuncture points, without the diagnosis and specific treatments necessary in TFT. There are a lot of refinements one can learn about EFT, but, bottom line, it simply involves tapping with two fingers along a series of points on the body. Any of us can learn to do this ourselves, and if we keep the issue we’re treating in mind by using a few key phrases, we can release the flow of energy which had been blocked. This often results in tremendous freedom and healing. At the conference I learned several methods which look like a string of initials: AIT, BSFF, EMDR, TAB, TAT. (If you’re interested, you can “Google” any of those acronyms along with he word “energy”!) Two of the techniques are very gentle, and I’ve found them helpful for things like insomnia (when “tapping” might be too stimulating while trying to fall asleep), and for headache, migraines, or upper body pain (when we wouldn’t want to aggravate the pain by tapping on already sore areas). “Touch and Breathe“, or TAB, teaches us how to gently hold the areas of meridian points while using a deep breathing technique which relaxes the body while encouraging the flow. The developers of TAB encourage specific treatment points for specific conditions, but I find it effective if I just use all my usual EFT points. I sometimes have bouts of insomnia, and I’ve been known to fall asleep with my fingers still on my upper lip, for instance, as I actually nod off during the treatment. I like the book The Energy of Belief very much, as it brings another perspective into these therapies (which I agree with), that we are more than just our bodies, and we can treat the “information systems” which exist beyond the body, too. Both authors were presenters at the conference, and I found them persons of integrity who “walk their talk”. Another new system I learned is called the ZPoint process. It works directly with the belief system, where all misdirections of energy start. I find it really helpful for healing relationships; taking the “emotional charge” out of sadness, betrayal, or emotional abuse. I learned this from the developer, again at the conference (it was SUCH an opportunity to meet these people 🙂 ), and his particular mission is to develop tools to allow us to feel at peace, virtually all the time, no matter what is going on around us. Sounds good to me! He had a very peaceful, calming presence during his presentation, and I wanted to have that, too. We practiced the process, choosing a colleague to bring to mind that we’d like to have a more peaceful relationship with. (Can you think of anyone like that in your life? 😉 ) I can honestly say I left the room feeling more peaceful, forgiving, and friendly towards the person I chose than I had in months. I was very relaxed, too. So, my basic toolkit starts with EFT. (I’ve posted this before, but I still think this nice 7-minute video from its founder gives a great overview, and has some cool graphics, too!) But, while I use EFT for most things, it’s wonderful to have techniques that approach the energy field from a little different angle to give some dimension to the practice. Anyway, I’ve never wanted to be just a one-trick pony. Peace; Salaam; Shalom. I went away; I learned things; I came back. Here are some notes about the annual Energy Psychology conference I attended recently. That title is a bit of a misnomer. The organization which sponsored the conference is called The Association for Comprehensive Energy Psychology, or ACEP. “Energy Psychology” is term coined by Dr. Fred Gallo, one of the conference presenters. But, equally, it was about Energy Medicine (from Donna Eden and David Feinstein, another of the conference presenters). The emphasis of the practice of Energy Psychology is often on psychological issues such as stress (it’s had great success with Post Traumatic Stress Disorder, or PTSD, for instance); phobias; and things like stage fright and performance issues. But, it is equally effective for physical trauma, disease and chronic conditions. In fact, Gary Craig, the founder of my favorite system did a series of studies on “EFT for Serious Diseases”, and he reported on some of those developments at the conference. Ah, Gary Craig, developer of Emotional Freedom Techniques (EFT) the method I most often practice! The man is a walking, breathing, living legend, but is so down-to-earth and real, one feels one is just talking to a neighbor. For those of us who’ve taken extensive video-based training with him, it’s like meeting an old friend—who may never have met us. He’s spent hundreds of hours in my home (on video) and he is exactly the same person whether being filmed for a documentary, presenting to a room full of psychologists and doctors, or wandering around the conference center chatting with us casually. Very fun and inspiring. There were morning and evening lectures for the whole conference of more than 400 participants; and many breakout sessions to choose from, which went into more detail about specific methods. It was inspiring to be with so many fellow energy practitioners from all over the world, particularly as this is a new and emerging field of treatment. At lunch I shared at table with a student from Norway and a tribal chief from Nigeria. This man had been fully trained in several of the methods and was eager to take them back to his country. One presenter from Korea demonstrated how energy methods could be integrated with the traditional medicine of that country. A couple of questions always come up when I discuss this sort of work. The first is: “If this energy stuff is so great, how come everyone isn’t using it?” —More and more people are using it. It seems to me that since the discovery of germs and penicillin in the West, not to mention the large pharmaceutical investment in healing technologies, that we have not been open to the more natural methods. Also, the concept of having an “energy body” doesn’t really fly with a lot of Western societies, as evidence had, for so long been anecdotal. Many of our grandparents had their favorite folk remedies, but we didn’t really give much attention to why things get “stuck” in our bodies to begin with. I’m here to tell you that there is more and more research and results of research emerging. It’s an exciting time to be in this field. The basic premise of the energy methods is that trauma, or residue from illness, becomes “coded” into our cellular structure. A strong emotion or physical trauma can put it there. Once there, it can cause all sorts of problems from mild anxiety to life-threatening illness. Drugs and surgery can treat the symptoms, but do not address how the condition got there to begin with. Surprisingly, Energy Medicine doesn’t necessarily “care” how the condition first got stuck in the cells. It believes, to use Gary Craig’s phrase: “The cause of all negative emotion is a disruption in the body’s energy system.” (“Negative Emotion” includes “Unwanted Physical Conditions.”) The key to relief is getting the energy to flow past and through these blocks, and in addition to talking about and getting clear on which issues need to be addressed, most techniques use some method of redirecting energy flow through the meridian system of the body. In the course of writing this post I discovered that I’d like to talk about the specifics of Energy Medicine, how I use it, and why I think it works. All of that would make this really long, so I’ll post about those things tomorrow. In the meantime I’ll say that the most exciting part of the conference for me was learning that more and more scientific research is being done in these fields, and that results of the research show consisitency and demonstaratable clinical effects. Devices can now locate meridian points in the body, register when flows are blocked, and again when energy is flowing again. Brain scans show differences before and after treatment. Statistical measurement tools gather data. All of this is tremendously helpful in establishing credibitly with the scientific community, and verifies what many of us have experienced. A couple of personal disclaimers: I don’t need empirical science to prove things. I know when I feel better, and clients tell me when they do—that’s good enough for me. On the other hand, I’m not a “true believer” in these or any other methods. I use them because I enjoy them, I get results, and that brings me and others more joy. I’m not about to be an cheerleader or evangelist for anything, as I have a predominant belief that we attract to us the tools that fit our experience of the moment. I don’t so much say that “it” works, whatever the “it” of the moment may be; rather that “we” work, and, amazing humans that we are, we find new and amazing aids to improve our adventures. Peace, health and happiness to you! Tomorrow: My two favorite new tools I got to take home, and why I “think” they work. You can watch the Mars Landing from my Backyard! …or almost. Those of us in the vicinity of the University of Arizona are proud and excited about the latest Mars Mission. Media coverage will begin at 4:00 p.m. US Pacific time, Sunday May 25. What will they find? Water? Signs of Life? Dust? You can take a look at this site and this one to see what we see. Southwest Style – Am I Home Yet? I’m still organizing material for posts on the energy psychology conference I attended last week. It was truly transformational for me; a life changing event. Since I’m not quite ready to talk about that yet, I’ll tell you about my travels. The conference was held in Albuquerque, New Mexico, about an 8-hour drive from my home in southern Arizona. I liked it there more than I thought I would. It’s a very southwest city, somewhat like Tucson or Phoenix, Arizona, but with its own distinct style. I was surprised at how big it is—I don’t know if I’d like living there, as I prefer a smaller more “manageable” area these days. I’m not sure why this is, as I grew up in a large metropolitan area, but I’ve found my niche in Arizona, and I like it here. 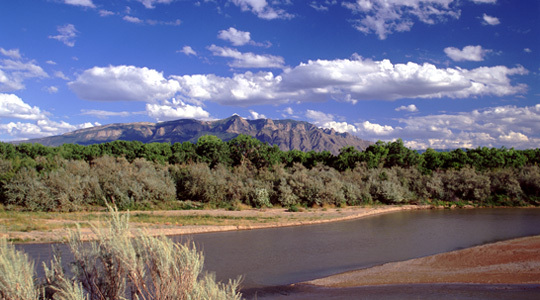 The only thing “wrong” with Albuquerque, really, is that it’s almost too much like home to be a “real” vacation. Of course, the fact that it’s fairly close by, and I didn’t have to get on a plane, factored greatly into my choosing to attend the conference there. It’s just that the last several trips I’ve taken have been from one southwest desert to another. I went to the Institute of Noetic Sciences conference last year, and that was held in Palm Springs, California (only 6 hours away!). That’s a beautiful place, too, and different than Arizona in many ways…but still a desert, and one of the few areas in California that truly has the southwest feel. Although California is further west, actually, than Arizona or New Mexico, it has become almost its own country, and the terrain of most of the state is not of that “deserty/southwesty” kind. But I digress. I cannot do Albuquerque justice, here, because I only spent time in two small areas of the city. I liked the conference hotel and area, but before I checked in, I decided to visit another part of town. It was pouring rain the day I arrived, and I had several hours to fill before being able to check into my hotel. The perfect solution was the New Mexico Museum of Natural History and Science. There are many musea like this scattered all over the world, so I won’t go into a lot of detail. My favorite thing here was Startup, a “History of Personal Computers” exhibit. This was so cool! The exhibit was funded by Bill Gates and Paul Allen (and their families and foundations). I’d always associated Gates and Allen with Seattle, WA, and the vicinity, and indeed that’s where Microsoft has been located for many years. I didn’t realize that the two of them had been hired to develop software for Micro Instrumentation and Telemetry Systems in Albuquerque when they were college lads, and started their revolutionary design and programming ideas there. I got to watch interactive media presentations detailing the history of personal computing, actually use working models of the first computers, play games, and watch interviews with people like Gates, Allen, and the Steves: Wozniak and Jobs. The exhibit’s website has a tour through the entire experience which is about 60% as good as being there, so enjoy, if that would interest you. After that, I visited Old Town, Albuquerque, a collection of preserved early adobe buildings now housing galleries and shops. The rain had mostly stopped, and this walk through history was most enjoyable. Now we skip to after the conference. I was only a little over an hour away from the state capitol, Santa Fe, so decided to go up there for a some down time before heading home. I’d been to Santa Fe with family about 15 years ago, and what I mostly remembered was that it had a plaza, and good shopping. This time around, I spent nearly all of one day walking about the town (it’s a great walking town), and I had two major impressions. One is that I’ve never seen so many art galleries collected in such a compact area, anywhere. There was art from all over the world, not just Southwest Americana. I saw galleries devoted to Chinese, Polish, Russian, Tibetan, and Spanish art, among others. In the Chinese import gallery, there was an artist in residence from Beijing who specializes in scenes of hunting on horseback with eagles. He explained to us that this kind of hunting still occurs in the area, and the eagles still find the prey for their humans. He was a very nice man, and is back in Beijing now. This gallery also had the most amazing and beautiful antique Chinese furniture. I walked up and down Canyon Road, a major gallery neighborhood in Santa Fe. To get an idea of just how many galleries there are in this relatively small town, take a look here. It’s just astounding. Many of the galleries are housed in old adobe buildings, and the stroll through the neighborhood would be worthwhile even if I didn’t enter any. 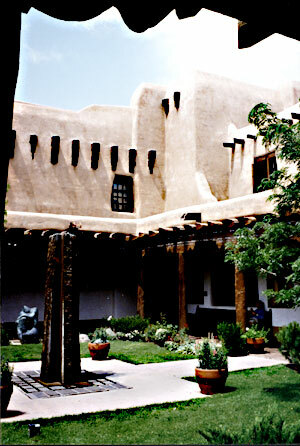 Most properties had beautiful gardens and courtyards, and are fine examples of the southwest adobe architectural style. Santa Fe is lovely, and this page has better photos and descriptions than I have come up with. I happened upon the page when I returned home, and I was struck with the fact that I saw everything that its author did, and it looked just like his pictures. My other major impression is that Santa Fe is the most “Southwesterny” town of the American Southwest. If you can only visit one city to get a taste of Southwest culture, make it this one. I’m glad I was there, although next time I go somewhere, I really have to choose somewhere NOT in the Southwest. 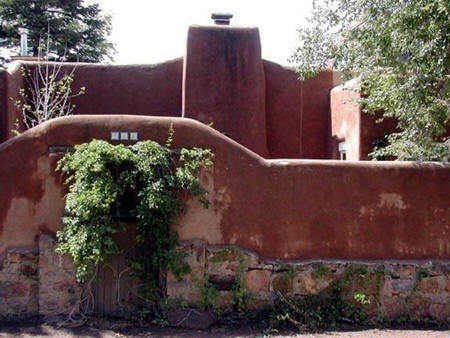 Although Santa Fe is a very concentrated Southwest experience, Arizona cities have all the local jewelry, art, cuisine, and culture; they’re just spread around a larger area. As wonderful as that all is—and the culture is one of the many reasons I live here—next time I want to go somewhere else! I just got home from a week-long trip to my neighboring state. I’d taken a walk ’round my neighborhood before I left, as I do almost every day, and all appeared to be well. I didn’t tell you in my earlier post (about the Desert Spoon in front of my kitchen window) that I also have an even bigger one right in the middle of my front garden. This one doesn’t bother me the way the kitchen window one does, though, as there is lots of room for it to stick out its prickly leaves. Or fronds. Or whatever it is this beastie has. Desert Spoons look like this most of the year, but every two or three years, in early summer, they’ll shoot a spike right up their middles. 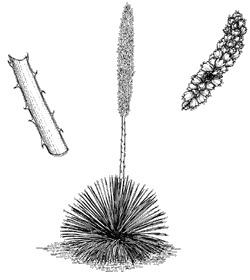 This is a fast-growing spike, and contains all the fun and heartbreak of their particular form of fertility. I’ve observed my very large Spoon do this twice in the several years I’ve lived here, (once with two spikes on the one plant—I was a neighborhood phenomenon! ), but the kitchen window Spoon, I thought, was too young for this sort of behavior. Alas, she’s all grown up. Literally. I’d said in my other post that she took up Too Much Room for the small area in front of the window. I was just away from home for one week, and when I arrived home I was frightened at first, as I thought an extremely thin and tall man was standing in front of my house. In Only One Week, both my Desert Spoons sent up spikes that are currently about six feet tall. They’re already too tall for me to look ’em in the eye, and they’re bound to get about 3-5 feet taller still. So now, when I look out my kitchen window, hoping to glance at the mountains, or the palms, or the citrus trees, I see this ginormous spike sticking straight up. It looks a bit like a very healthy, extremely large asparagus spear. This is because it hasn’t flowered yet. When it does, I’ll know its gender, as each individual plant is one or the other, and has different flowers. I’ve already called Kitchen Window Spoon a “she” as I know the other one is a male. I’m hoping to have one of each! I re-read my previous Spoon post, and I said there that I was going to have the plant removed before 2008 is over. I still intend to do that, but I just can’t right now, can I? It’s having a spike, and is going to make flowers, and it just wouldn’t be right to cut it down in its prime. Darn. The weird thing about this (as if having a spike on each plant in the same year wasn’t strange enough) is that, during my walk around the neighborhood today I saw that Nearly Every Spoon I saw on my half-hour walk had a spike! What’s going on? In my admittedly limited experience of the Sonoran Desert, I have never seen such a thing before. Is this a particularly fertile year? Does it have something to do with global warming? Have aliens visited and sprinkled Spoon fertilizer among us? We’ve been having rather strange weather, too. I’m a little bit disturbed, but I shall post bravely on. Tomorrow: my thoughts about Santa Fe; and then—Conference Notes 101! I am here, in an area not unlike where I come from. The temperatures are a good 10-12 degrees cooler (4-5 C), and the mountains are beautiful. I do like my mountains. 🙂 I’m at a conference on energy medicine and psychology, and so far it’s been great. I’m taking notes for some good posts! Hope they live up to my expectations (and yours!) Cheers, see you soon! Human rights; nature’s fury; what do we make of it all? As I write this, several parts of the world are attempting to cope with the aftermath of cyclones, earthquakes, fires, and floods. I usually get my first news of the day from AmericaOnline, but after today, I shall make another page my homepage, and here’s why: The reporting they feature is pretty good, perhaps not the best, but in reading through the most current reports about the situation in China, I found myself scanning the comments they allow to be posted at the end of news articles. I don’t usually read the comments on these articles, having not enjoyed them in the past, but perhaps I was expecting something different this time. I won’t dwell on them, other than to say that the appalling lack of sensitivity in some of them left me stunned. Many, many comments were callous, immature, and completely without any sense of compassion. I rarely allow myself to become this upset about an issue, because I strongly believe that A Very Upset Person is not as much use to the world as a Strong Centered Person. Given this, I had to ask myself what these emotional triggers were about, for me. I discussed my reactions with a friend, who asked me to think about who it is that posts such comments. My friend reminded me that most of the people in the world are kind, wonderful people, (like the ones that read this blog! ), it’s just that those do not get as much press coverage. The people who post comments on news stories are often those who are seeking their five seconds of fame, and think that by shocking the rest of us they will get it. This is all true enough, and it was good to have that reminder. Once I got beyond my initial anger and sadness, though, I had to ask (because I MUST ask 😉 ) what I wanted to to with these emotions now that I was aware of them? I looked; I sought; I pondered. One of my favorite teachers says not to focus on others’ disasters unless you intend to do something physical or tangible to help. And if you do the helpful thing, do it because it feels like the right thing to do, not out of guilt, or because someone else thinks you should. So, for instance, in the situation which has currently become known as “The War”, either I should take some action such as volunteering to obtain and ship supplies to the troops, start a letter campaign to lawmakers, or join up and fight. Otherwise, if I’m not going to do these things, it’s best to stop talking about “The War”, because all I do is become mired, and help to mire others, in angst, anxiety, and fear—and this does not help. I believe this sincerely, and it’s one of the reasons I often avoid major news outlets, because it seems their very purpose is to mire us in angst, anxiety, and fear. I have given a lot of thought as to the “why” of that. A quote attributed to Gandhi is: “Be the change you wish to see in the world”. I do believe that before I can go around deciding how to “fix society”, some of my time would be well spent in “fixing myself”, as I’d then be of more use and more at peace with the next actions I take. Please understand that I’m NOT saying I’m “broken”, or that any of us are. We are all the perfect “us” at the perfect time. I just believe I am a stronger person when I can let go of some residual fear and unkindness within myself which makes me feel disconnected from you, and from the population of the Universe. BlogCatalog has declared May 15 as “Blog for Human Rights” Day. I’ve participated in two others of their Bloggers Unite campaigns, and I generally feel good about doing so. In thinking about “Human Rights” in wake of current “Natural Disasters”, what comes to me is that one of the more basic human Rights, after the basics such as food, clothing, and shelter (which of course, not everyone has at the moment) is the right to choose ones life path. It seems some repressive regimes, some weather occurrences, and some levels of lack prevent many from having that luxury. There is a local chapter of UNICEF in southern Arizona which allows me to join the international organization, too. The first thing I saw on their website was the slogan Unite for Children. In addition to them being there for relief in the current situations, they work for children’s rights throughout the world. As I believe children ought to be treated with dignity, respect, and value, this interests me. Another thing I like about UNICEF is that they are “for” many more things than they are “against”. This is a crucial balance for me beacause I believe in the value of positive language. I’ve also made a donation to the International Federation of Red Cross and Red Crescent Societies, after making sure that the the Magen David Society of Israel was also a member (using their own symbol, as well as the new “connotation free” symbol the Federation now has). I generally don’t support organzations focused within one particular religious tradition, so their breadth and scope was important to me. The above actions feel right and good to me. I don’t necessarily recommend them, they are just what has inspired me today. May you find your own peace within your own world. Namasté. To all of you who are mothers, and/or have mothers, I wish you a wonderful celebratory weekend. So many of us think of Mother’s Day as just another Hallmark moment. I’d like to think of it as more. I neither have parents nor children, presently. (I did have parents at one point; but they’ve passed from this earthly existence. I didn’t want you to think I’d sprung, fully formed, from Pluto, or somewhere. 🙂 Although there are those that wonder…) I therefore don’t have to deal with which cards and/or gifts to obtain—something I’ve never been very good at, but I can get a bit pensive this time of year. Not because I miss my own mother (I’m not saying I don’t) but because I notice things like all the emotional energy people put into this holiday, and it seems a combination of love and guilt; of joy and thankfulness coupled with vague uneasiness. And why is this? Of course, if it’s a good, loving, family, they come to a place of joy and love and nurturing, too. I think where it gets confusing for both the parent and the child is that mixed up someplace in all this is the notion that “to love is to worry about”. Parents want to protect their children from perceived danger, and in so doing, tend to overlook the apparent fact that the child, if left to her/his own devices, without the burden of the “worry” will make many choices appropriate for her/him. My belief system includes a doozie: that children come into this world knowing who they are; knowing they have a connection to all that is, and with a full set of expectations about what they’d like to accomplish while here. I know many mothers—and fathers, too, who encourage self-exploration in their children. This is the best kind of parenting, and I salute it. I saw an old friend a while ago. She was my babysitter when I was five and she was fifteen. We were both rather odd children, felt we didn’t fit in (I know, it’s an old story, but when it’s yours, it’s as if it were told for the first time.) We bonded in many ways; became like siblings instead of babysitter/client. At the time, my parents were working full time in their business, and I was convinced they liked the business more than they liked me. This was true on some level. I felt they needed this babysitter-person to keep me out of the way. I didn’t realize at the time, but my babysitter valued her time with me as much as I did mine with her. She had an older brother, but he was uncommunicative. This new child (me) was cute, inquisitive, and thought the world of her. As time went on our sibling/friendship continued. She got married when I was ten and she was twenty. I didn’t much like her groom, a person I’d known almost as long as I’d known her. Nevertheless, I was pleased to be asked to participate in the wedding, even though I wasn’t the right age (too old to take on one of the little kid’s roles, not old enough to be in the grown-up lineup). I made friends with the flower girl, a charming cherub that refused to let go my hand during the entire reception. The pictures of this are among my friend’s favorites. She had a baby when she was twenty-five and I was fifteen. I was asked to be a god-parent—again, not quite the right age for such a venture. We didn’t care. The baby seemed pleased enough. Both of us now have re-evaluated what it means to be a god-parent. Though raised within the same religion, we’ve traveled divergent paths since then. The little girl, my god-daughter, also goes her own way. She got divorced when she was thirty and I was twenty. I can’t say I was disappointed, for myself, as her husband was my least favorite part of visiting her. Don’t get me wrong, he’s a decent, good person. I just wished for her so much more. My heart went out to her, as she was now something called a “single mother”. She had two more children by then, both boys. The five of them did the divorce dance: lived with the mom, saw the dad on weekends and holidays. Everyone remained cordial, the kids were fine, so far as we know. She came by to see me a couple of years ago. She lives two states away, and as we’re in the west of the US, it was quite a trip. She travels a surprising amount, now. She’d discovered her birth family, and has a whole new set of cousins. I was shocked to learn that she’d never felt she belonged to her adoptive family, even though she remembered no other. She was raised to think—as I was—that the bonds of love in a created family are strong, and good, and sure. Oh yes, her little girl, my god-child: she was adopted, too. My god-child is being encouraged to find her birth family, if she and they wish this. There is open communication about how there can be many kinds of relationships in our lives. She is loved, and she knows it. She is special, and knows that. Her brothers are not adopted. She has come to terms with that, as have they. During her visit, my dear lifetime friend told me of how her parents were so afraid of losing her, after waiting years and years to have a child, that they clamped down upon her every activity. She was not allowed to do the usual teenage things. Her engagement, at such a young age, was her bid for freedom—kind of amusing, really, as she married the son of her parent’s best friends—nevertheless, he was there, and willing, and took her to a different place in her life. As she drove off, to meet more new cousins, I couldn’t help but think of my own first family. How I sometimes was convinced I must be adopted. (Do many of us do that?) My parents, like hers, were much older than the other kids’ parents, and being a sensitive child, this embarrassed me. They were so, well, uncool. They were my natural parents, though, and I spent my childhood in sort of a muddle, as I was the same age as my second cousins, rather than my first. My sister, my only sibling, is a lot older than I am, too; in fact I can’t remember a time we lived together in the same house. Her children are not much younger than I am. So, I really don’t fit in, age-wise, philosophy-wise, religious-wise. I go my own way. But when I reconnect with someone like my former babysitter, I’m glad. She recently sent me an email, wishing me a happy birthday. Our birthdays are within a month of each other’s, and of course I know exactly how old she is. She now lives in two cities, and her children spend time with each of their parents. They’re very independent, yet know they are cared for. She and I live such different lives. But, we became the persons we are today with each other’s support, and understanding, and love. Are we spacey or just universal? The video puts it all into perspective. But come back, because I have something else to show you. It’s easy to take this all too seriously…so another perspective lightens it up a bit. You don’t like to compromise, to the point of being self-destructive with your stubborness. Saturn is a mysterious planet that can rarely be seen with the naked eye. You are perfect to rule Saturn because like its rings, you don’t always follow the rules of nature. And like Saturn, to really be able to understand you, someone must delve beyond your appearance. You are not an easy person to befriend. However, once you enter a friendship, you’ll be a friend for life. You think slowly but deeply. You only gain great understanding after a situation has passed.